Finding an art community while traveling is sometimes difficult and after almost a year, I was feeling drained. 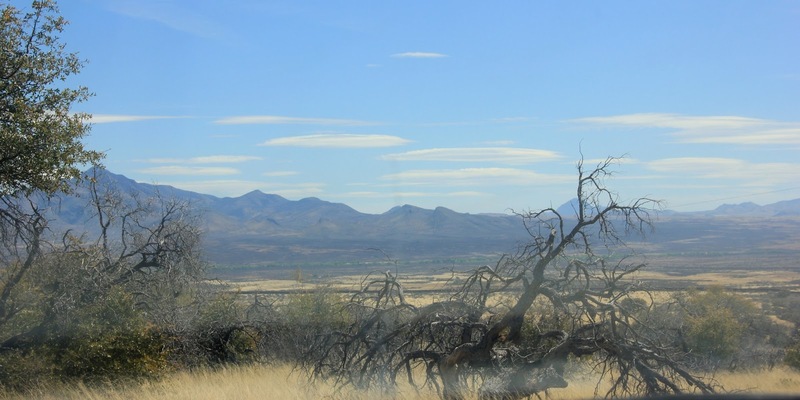 My husband Roger went to the Coronado National Monument in Hereford, Arizona to take photos and saw a flyer at the Ranger station announcing a Field Journaling Workshop with Linda Feltner and I knew I'd be there. Her work is amazing and I knew it's exactly what I needed. So off I went. Linda's enthusiasm alone is healing to an emotionally "starving artist" and then she brought her journals and sketches and watercolor studies. She did a show and tell about how she packs her sketching kit, what watercolor pencils she has and watercolor charts that she does and places them in the cover of her watercolor boxes. At this point if we never sketched I was feeling the healing taking place. I can be a perfect hermit, working on my own and being happy but every once in awhile its wonderful and necessary to connect with like minded people. Thankfully I have an artist friend I do text or call as my life line but this was hands on, right in your face therapy. I'm hoping Linda didn't mind me hugging her before I left and thanking her for a great two hours of learning and observing. I did want to join an artist group while we were in Black Meadow Landing but their meeting were always at night and I chickened out since it meant driving back home over the incredibly dark twisty mountainous road but I'll be back in Florida for a week before we head North for the summer and I'll connect with art friends then. A few photos from my time at the Park. I sat away from the crowd and some children that became restless after drawing and started to concentrate on the bark of an Emory Oak. (I didn't know until I asked Linda) It's then I realize that what I do everyday is so etched in my psyche that I can do it blindfolded. A good thing? In one way but then in another, have I lost something? For one thing, it wasn't what I'm usually doing so my brain right brain was telling me that it was boring. Isn't there a dog I can draw? There was actually but I didn't. lol Sheila....just do it. I mentally complained through the entire session. Ugh..the pencil is wrong, I'm smudging it everywhere, oh the white gel pen isn't the right size, and I lost my place on the tree to I really think I dislike this tree, maybe I should have sat over at THAT tree. Leaving I pulled over in some pullouts on the road out of the park. Definitely references for paintings. !!! What a country!!!! Thanks for stopping by..heading East in a week and a half..not sure how I really feel about leaving this beauty. The expanse and solitude really calls to me, as long as Amazon can deliver my art supplies and I can connect with artists every so often to re-energize. Wonderful blog post... So glad you had that workshop out there.... Looks like a great experience. Sometimes, timing is everything! You were hungry for this and there it was! A great blog post, my friend. Thank you for sharing this great opportunity. I agree, it is good to join in some workshops, it's inspiring. Glad you got to join one yourself, and yes I agree, it is wonderful countryside. It renewed me Ann!! Thanks!! Huachuca City, Arizona Huh? Where?